Posted on May 26, 2015 at 10:49 am. The month of May has seen a number of new Microgaming slots released at their supported online casinos, and each new pokies machine doesn’t disappoint. From mermaids to chefs, and penguins to elephants, every slot released this month has something unique to bring to the Microgaming pokies catalogue. You can play any and all of these new releases at the following Microgaming Internet casinos. 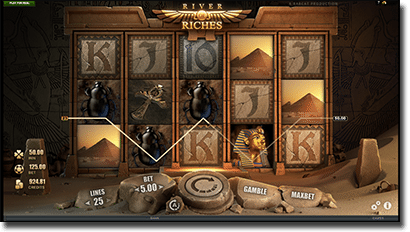 River of Riches follows an Ancient Egyptian theme, which seems to have an Indiana Jones feel to it, and is just one of that many that have been created due to a partnership between Microgaming and Rabcat. This means the stunning 3D graphics are the main attraction. With 25 paylines and 5 reels this slot includes free spins as the main bonus feature. Three of more Scatters will trigger 10 free spins but during this round four fixed Wild symbols can appear for players to win big. River of Riches also includes the Gamble feature which Microgaming has become quite popular for, with winnings doubled if you guess the colour, out of red or black, right or quadrupled if you get the suit of the cards right. Two free spin features make this slippery slot worth a try. With a 5 reel and 25 payline format, five penguins are the star of the show on a backdrop of snowy reels snow. To trigger the 25 free spins feature, land three of more Scatter penguin symbols. Since each penguin is worth five spins, the more penguins you land, which dive into the water every time you do land them, the more free spins you will receive. Additionally, if you only get three Scatter symbols then the two penguins which remain on the ice double all your winnings during the free spins round. Penguin Splash also has the infamous Gamble option. Featuring an underwater mermaid adventure, Ariana has a 25 payline format set across 5 reels. The drawing card to this slot is the expanding symbols which give players the potential to win big. These symbols are stacked on the first reel and expand to match the symbols on the reels. Additionally, the Scatter symbol, which is the Starfish symbol, sees three Scatters or more triggering free spins. Here, Wilds are stacked on the first reel and can expand to fill the entire reels. 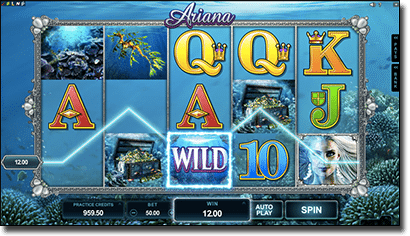 Ariana is available to play in instant mode, via the downloadable software, and even on a mobile device, such as a smartphone or tablet. The Adventure Palace slot has been around for quite some time now, but Microgaming re-released the pokies in HD which has meant the graphics have stepped up a notch. Featuring the ability to stop the reels manually, players who think they have the skill to stop it in their favour should try this poker machine now. There are 15 free spins with a 3x multiplier up for grabs, and the chance to double your winnings if the Wild symbol, which is the Elephant image, creates a winning payline. Adventure Palace HD also has the Gamble feature. Big Chef brings an exciting new feature to the pokies, known as the Rising Wilds. 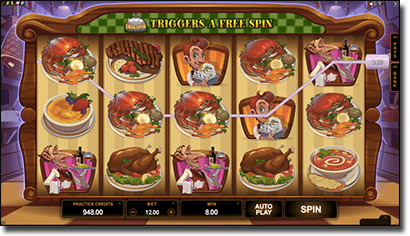 While the gourmet restaurant theme is attractive this feature is even more so with each Wild symbol rising up the reels during the free spins bonus feature. Once it is on the top reel it will stay there for one more extra spin. To trigger the free spin bonus you need three or more Scatters and you will then get 10 free spins with an additional 2x multiplier attached. There is also another Scatter symbol, which is the silver cloche, that will trigger a single free spin if it appears on the fifth reel. With just one week left in May, players should give these slots a spin before Microgaming release their new pokies for June and we have a lot more to try.